The predominantly used PT method in Scandinavia due to the high sensitivity to interferences. The assay can be used with both whole blood and plasma. Prothrombin Time (PT) is one of the most frequently measured/analysed coagulation parameter. The Owren’s PT method is predominantly used in Scandinavia, Japan and parts of Benelux and Austria, where it is preferred over PT Quick method since it is less sensitive to interferences, and can be used with both whole blood and plasma. MediRox Owren´s PT reagent GHI131-10 consist of lyophilised thromboplastin from rabbit brain powder and plasma fraction of bovine origin. The plasma fraction is to high degree deficient in FII, FVII and FX is the source of fibrinogen and FV. The reagent formula has been designed to create an extra strong clot, making it suitable for both mechanical and optical measuring systems. 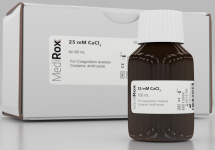 MRX PT Owren’s reagent is intended for the determination of Prothrombin Complex Activity and gives information about the activity of the vitamin K-dependent coagulation factors II, VII and X. A main reason for the preference for this method in Scandinavia is that the Owren’s method, in contrast to the more frequently used Quick method is less sensitive to interference by lupus antibodies, platelets or excess of citrate anticoagulant. The insensitivity to variations in Factor V and fibrinogen is also appreciated. In addition, PT Owren’s can be measured in whole-blood or plasma, and since it employs a greater reagent-to-volume ratio, it is more suited for near-patient applications. Furthermore, the heparin insensitivity is better for the Owren’s method than the PT Quick method and to further increase the insensitivity to heparin, a polybrene buffer is available. Provided that results are expressed in INR, PT Quick and PT Owren’s give comparable results. Latex-based liquid components for quantifying free Protein S in human citrated plasma using readers with wavelengths 600-800nm. Lyophilised reagents for quantifying fibrinogen in human citrated plasma, according to the Clauss method. FXa-based chromogenic assay consisting of liquid components for quantifying functional Antithrombin activity in human citrated plasma. Two different lyophilised reagents for detection of fibrinogen abnormalities, and the presence of heparin and other thrombin inhibitors in human citrated plasma. Liquid compontent kits containing phospholipid extract and silica contact activator. Sensitive to heparin as well as factors and insensitive to lupus anticoagulant. Latex-based liquid components for quantifying D-dimer fragments in human citrated plasma using readers with wavelengths 350-900nm. PT reagent from rabbit brain origin with an ISI ~1 for responsive determination of Prothrombin Time in citrated human plasma. If you have any further thoughts or questions, don’t hesitate to call us at +46 (0)155 45 44 10.